So, to a Caerphilly. A South Wales town only a short distance north of Cardiff. An area I’d never visited and not one I would’ve considered exploring, when looking for a day walk of reasonable distance and duration. Naturally, I’d be drawn further north to the mountains… But Matt (who always leads good walks) had devised a thirteen-mile route through the woods that we were destined to follow. 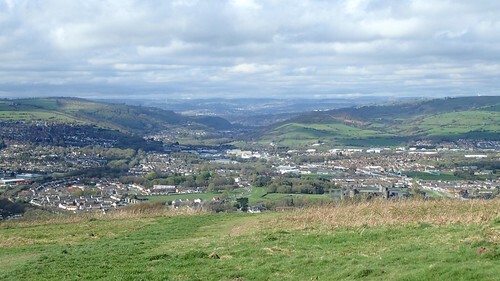 We would start from the car park beside the Caerphilly Mountain snack bar… Just to confirm, there are no actual mountains in Caerphilly but, the parking is free and there’s no apparent obligation to buy anything. Although, if you’d like to feast on a burger that’s larger than your own head, this is definitely the place to come! 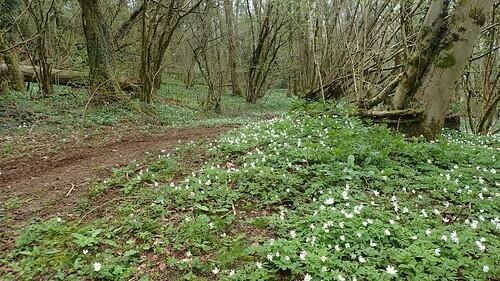 When it comes to retracing this route, I’m mostly at a loss, as we were walking from one woodland path and on to the next. 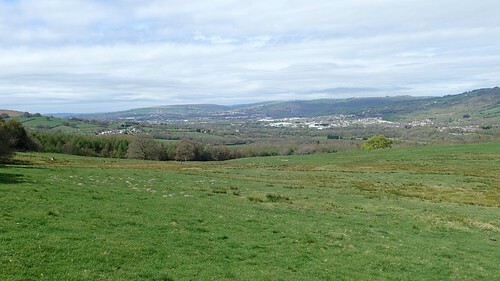 My guess is that we walked east across The Warren, continued through Wern Du and possibly joined the Rhymney Valley Ridgeway Walk en route to other forests. 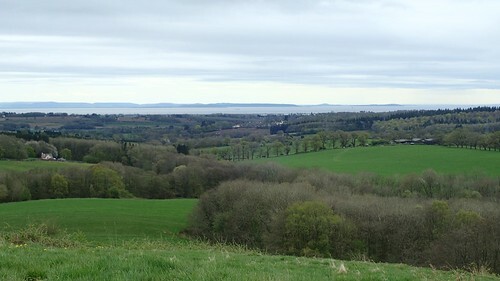 At some point close to a castle, we stopped in a field looking on to the Severn Esturary. This was our lunch stop, I think. 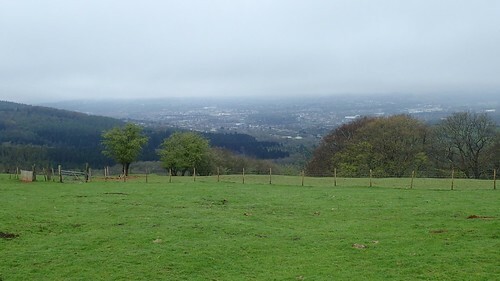 I found it interesting to be able to observe the scene from this perspective… You can see the line of the Mendip Hills. 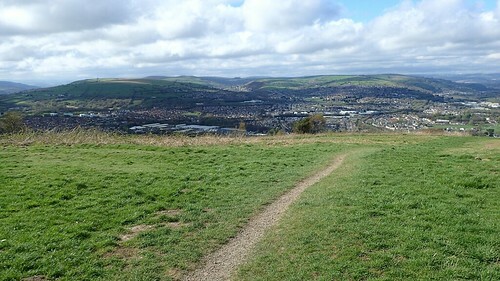 Crook Peak. 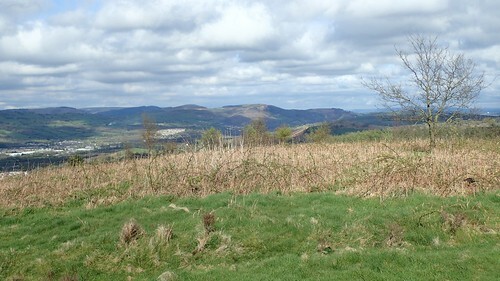 Brent Knoll stands alone while Sand Point and Brean Down lead out to sea. For me, it was like looking from the other side of a mirror. There was, indeed, a castle nearby and barely visible through the trees. But, which one? Well, Caerphilly Castle is surrounded by a moat and it didn’t look like Castell Coch. I can’t see any others on the OS Map nearby. Perhaps it’s a folly? This walk took place towards the end of April and, after an enduring winter, we found the many long-awaited signs of spring. 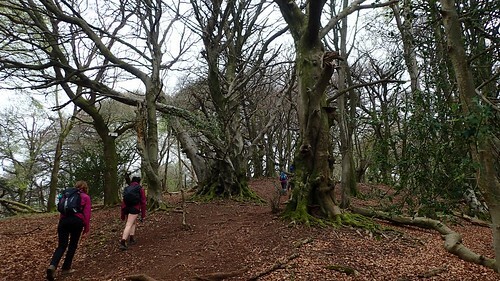 For some, on a day where the sun shone, it was a time for shorts, while most others stuck with more insulating layers. 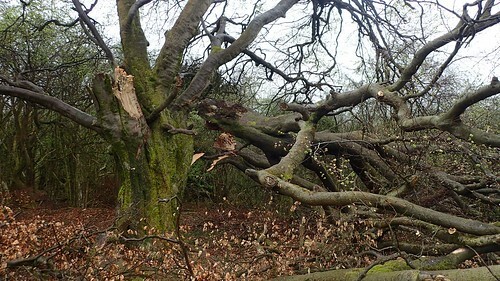 On our return towards the cars, we found a couple of gargantuan trees that had fallen, causing the odd obstruction to the right of way. 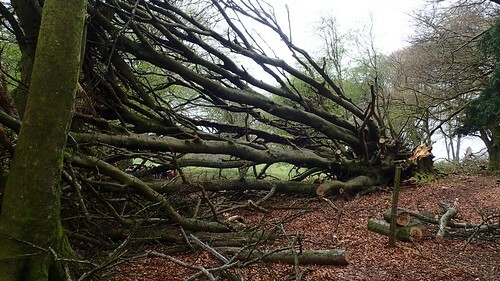 There was a threat of the weather changing – it seems that even the lowland areas of Wales are no exempt from this. 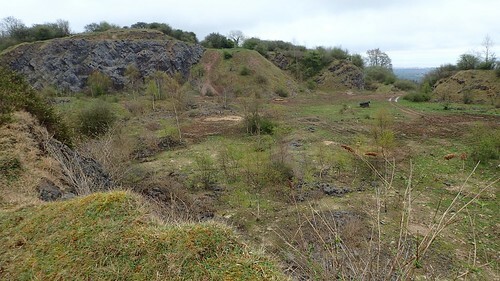 We also passed the impressive crater of what was perhaps once a working quarry. 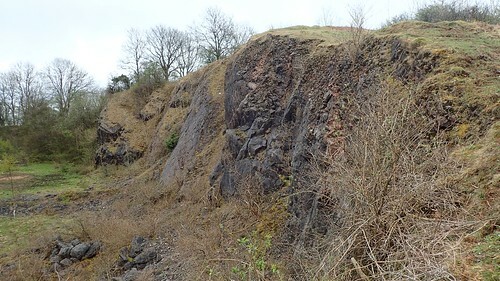 This might’ve been along the Rhymney Valley Walk and just west of the Caerphilly Tunnel running underground. 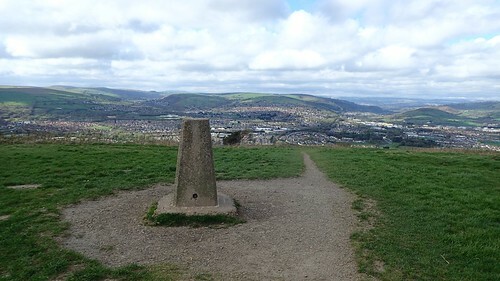 Shortly before returning to the cars, we climbed to the top of Caerphilly Common and bagged the trig pillar at 271m above sea level. A great way in which to end the walk; saving the very best of views until the end. 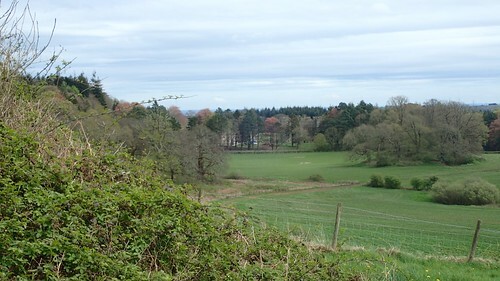 Higher points exist to the west and then north-east of here. 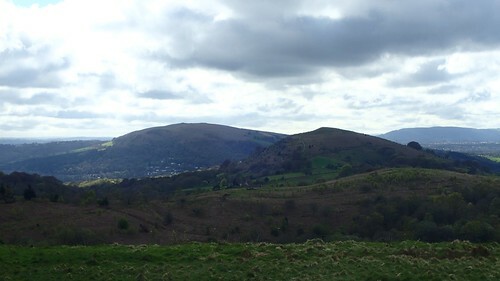 Although not as mighty as the Brecon Beacons, I hope to be able to explore them in time. 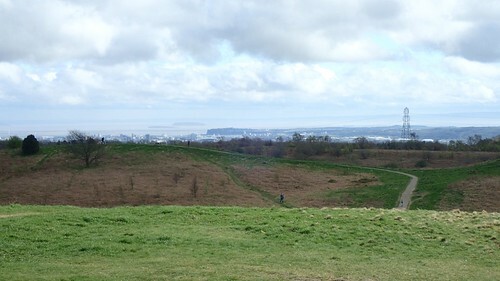 Looking out to the Bristol Channel one last time, I could see Flat Holm and Steep Holm out to sea. I’m often viewing this from a different direction. 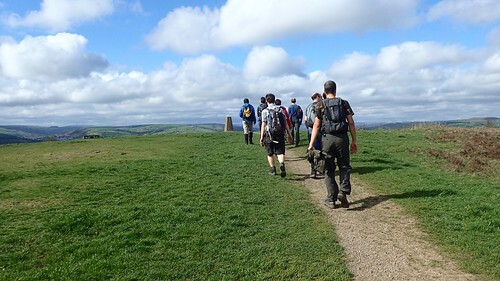 We then made our final descent down to the wind-blasted snack bar, where most of us voted in favour of ice cream, due to a limited selection of ‘snacks’ (beyond the obscene) and hot drinks that were only to be coughed out by a machine. 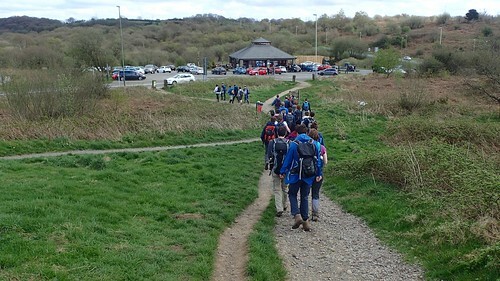 This entry was posted in Wales and tagged Brunel Walking Group, Caerphilly, Caerphilly Common, Caerphilly Mountain, hiking, Walking on 05/06/2018 by Olly Parry-Jones.